We had SO much fun last month. 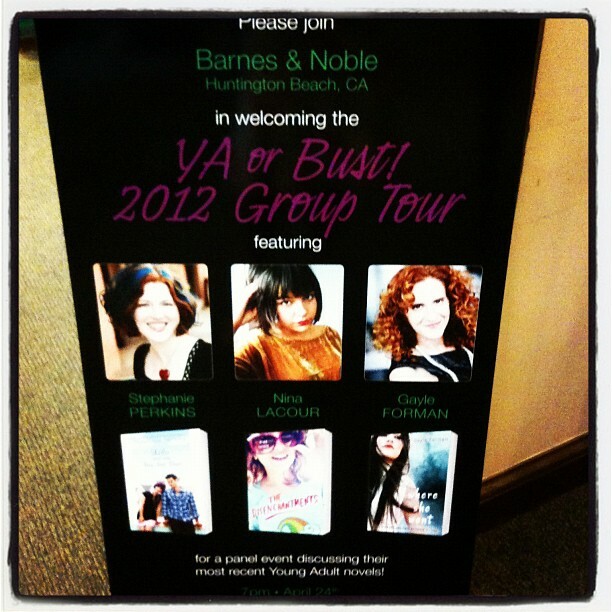 We got to sit down and chat with Stephanie Perkins, Nina LaCour, and Gayle Forman at Penguin's YA or Bust! tour stop at the Huntington Beach Barnes and Noble-- and that's not all! We also had the opportunity to moderate the author panel at the event. What an honor! These fabulous authors had great crowd of enthusiastic readers, and we had a fantastic time interviewing them for both our podcast and the panel. This road trip edition of the podcast also marks the debut of our Teen Correspondent, Ava, who is completely awesome! Find her as @YAvaReads on Twitter. She attends a lot of book events in the SoCal area, and will join us as a third interviewer on the podcast when our schedules all match up. We hope you enjoy our interview with these three amazing authors, as well as some event coverage featuring another awesome author who just happened to be in the crowd. Listen and find out who it is...! And be sure to check out The Booktubenator'sYouTube channel for more awesomeness. Next up on Authors are ROCKSTARS!, we have interviews with Martha Brockenbrough, Hilary Graham, Jenny Sanchez, Leigh Bardugo, Jessi Kirby and Anna Carey. We are so excited to bring you all of these great interviews! We'll also be attending ALA Annual in Anaheim next month, so be sure to find us and say hello. As always, thank you for listening! Hosting courtesy of archive.org. Intro music by 46bliss. Special thanks to our sound engineer, Marc Conrad Tabula, for editing the interview in this episode. Be sure to subscribe to Authors are ROCKSTARS! on iTunes! Eek! So awesome. Thanks for the shout-out, guys! <3!